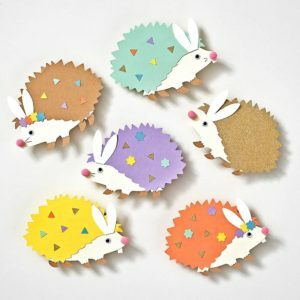 One of our favorite new arrivals to the collection this year is the Hedgehog Bunny kit. How can you not love an adorable little friend dressing up as a bunny? Below, we outline three ways you can use this kit in all of your spring celebrations. Before you begin, follow the step-by-step instructions that come with the kit packaging. Feel free to be creative by mix and matching colors to give them a little extra personality! First, select your finished kit piece you want to be the feature of the card. 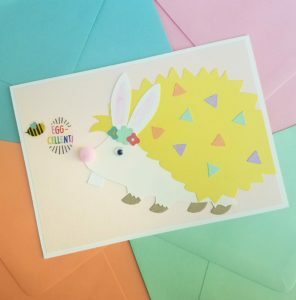 Next, adhere the hedgehog onto the front of your blank card using double sided tape. We used an A6 folded note card. Then simply add a few decorative stickers or handwrite a message like “Happy Spring” on the front of the card. To finish, choose an envelope in matching color and size so you can send it in the mail. If you want to add something a little extra, try adding an envelope liner. You can create this same looking using our Little Lamb Kit, Tulip Wreath Kit or Unicorn Garland. First, select your finished kit piece you want to be the feature of the card. Using a marker or pen, write a message on the back of your finished piece for the recipient. Then, using the hole punch add a hole at the top for your string or ribbon to go through. To finish, simply pull a ribbon through the hole and tie around your gift. 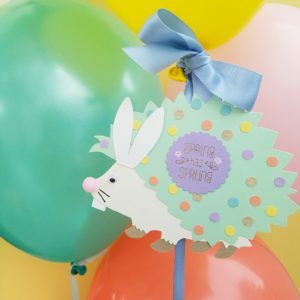 We love creating gift tags to add a personalized touch to our wrapped presents, in balloon bouquets or around treat bags! You can create the same looking using our Bunny Paper Dolls, Bunny Eggs or Funny Faces Craft Kits. First, use scissors to trim paper lunch bags down in size (a little more than half way). Be sure not to cut the bottom of the bag! Once cut, open the bag to stand. Next, cut long strips of paper from left over pieces in your kit. You can decorate these stipes of paper with washi tape, stickers or hand letter names. Then, fold over your paper stripe and adhere to the inside of your paper bag using double sided tape. To complete the basket, add your finished hedgehog piece to the paper bag using double sided tape. Finally, fill your favor basket with colorful paper shred and tiny party favors. We suggest a light up chick, bouncing ball or junior mints! 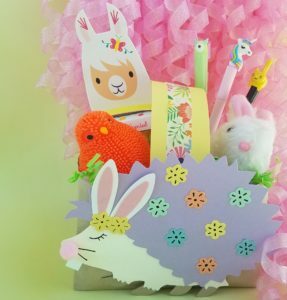 You can create the same looking using our Bunny Easter Basket, Llama or Dinosaur Craft Kits. Share your DIY projects with us using #papersource!